One of the key problems in evidence-based medicine is the lack of access to all the data required to make an informed decision on the effectiveness of an intervention. There are several key aspects to this problem. Several case studies from recent history can be called upon to help explain this issue, but none stick out more than the Tamiflu scandal. The swine flu epidemic of 2009 led to a general panic. The media created fear through constantly reporting the risk of death from contracting swine flu. One of the major problems from swine flu was indeed the risk of complications and a prolonged stay in hospital. So the governments of the world turned to the healthcare industry to ask if a vaccine could be found. But when the Cochrane Collaboration were trying to produce a meta-analysis of the evidence to support the prescribing of Tamiflu, Roche opposed the release of all the data from clinical trials, that had been used to persuade governments to take action. Vioxx, which led to deaths from improper prescribing, due to a lack of clinical trial evidence. Reboxetine, for which academics such as Ben Goldacre have found that unpublished trials showing Reboxetine to have no effect outnumber the published trials showing a positive result. It is a ridiculous situation. ALLTRIALS is championed by academics such as Fiona Godlee from the BMJ, and Ben Goldacre, the prominent academic and author of Bad Pharma (see our 'Other Resources' page). It is a petition seeking to make available all trial data, whether or not they showed a positive or negative result, so that all the evidence can be properly reviewed. We are down as being official supporters of the campaign and we need you to go and add your name to the growing list of names already there. 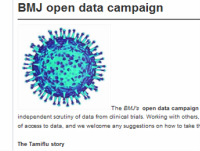 The BMJ's open data campaign aims to achieve appropriate and necessary independent scrutiny of the data from clinical trials. Working with others, they aim to highlight the problems caused by a lack of access to data. The website, which can be found at the link below, is a repository of all the correspondence sent to Roche, the Cochrane Collaboration, the European Medicines Agency and other information.